Seniors at Commodore Perry High School invite students and staff to share gratitude. The Commodore Perry School District has taken significant measures to keep its students and staff safe by adding a school police officer, keyless entry systems, high-tech security cameras, two-way radios for all staff members. While important, perhaps the most recent effort will have the greatest impact: practicing kindness and compassion. Students, staff, parents, law enforcement and community members joined together during three different events to learn about Rachel’s Challenge that is based on Rachel Scott, the first victim of the Columbine shooting. With a strong belief that she would die at a young age, Rachel determined to live her life by showing kindness and compassion to students that were new to her school, had special needs and were targets of bullying. She journaled her conviction that people could start chain reactions of kindness if they were intentional in their daily lives. Moved to action by Rachel’s Challenge presentations and the mission of Rachel’s Challenge, students from grades K-12 committed to working together to find ways to show kindness and compassion to others. So how will practicing kindness impact school safety? Consider a recent article in “Psychology Today” that shared common denominators of school shooters: was a recent or current student; felt harassed, bullied, or unfairly treated by peers and teachers; was socially awkward or a loner; and felt a sense of hopelessness. Creating a culture of kindness and compassion for ALL students addresses each of these concerns. Building personal relationships in a small school and community makes this vision achievable. 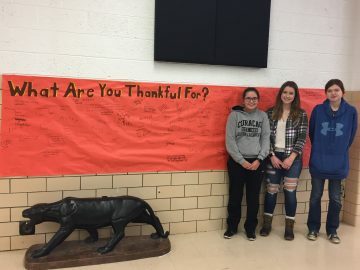 While the program was introduced just a few days ago, students have already started Instagram accounts to share positive messages about each other, created ways to fundraise for charities, and written letters of appreciation to staff members. When students feel connected and valued by their peers and the adults that surround them, the motivation for violence diminishes, and a safer school community results.